If she wanted help changing the world for one forgotten child, she chose the wrong man. Seventy-two-year-old Francis Frick would scorn his own family to close another deal, but that doesn't bother Bee, the small, childish, flying being that haunts his bedroom each night. She is an optimist, seeing potential where none exists, and so she hovers above Frick's bed, eating pomegranates, and waiting for his eyes to open to the possibilities. One night, it finally happens. A rogue droplet of juice slips through her fingers and hits the sleeping Manhattan businessman on the forehead, thrusting him on a series of baffling adventures to some of the twentieth century's most brutal regimes -- all to help Bee save a forgotten child of history. 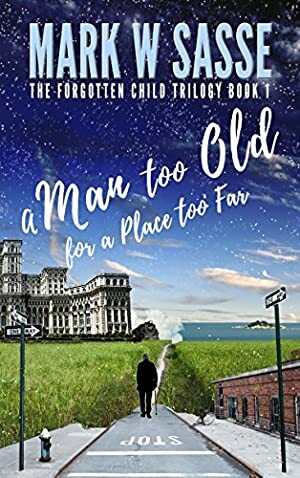 A Man Too Old for a Place Too Far is part one of The Forgotten Child Trilogy -- a one-of-a-kind adventure that mixes time travel, magical realism, and historical fiction into a contemporary story about an old man, his estranged daughter, and a tiny flying being in a white robe, who chooses to believe that anything can happen with enough prodding and an endless supply of pomegranates. Track It. This book reaches FREE about 3 times a year. Log In to track Mark W Sasse on eReaderIQ. to be notified each time the price drops on any book by Mark W Sasse. to stop tracking Mark W Sasse. We started tracking this book on January 1, 2018. The price of this book has changed 12 times in the past 479 days. The lowest price to date was FREE last reached on February 21, 2019. This book has been FREE 5 times since we started tracking it. The highest price to date was $3.99 last reached on July 23, 2018. This book has been $3.99 4 times since we started tracking it.